During meetings, private presentations, or even drinking at a café, a Beaubleu often catches someone’s eye, and the question arises: How did you come to this design? Today we take time to explain this to you. Before we jumped on the paper to scribble a tangle of two circles, one of which is shorter than the other, we had first to define a concept. 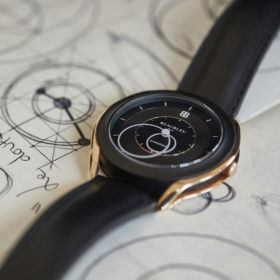 One is very quickly tempted to start the design of a watch by its style: vintage, sporty, futuristic, modern etc. We started by asking questions, such as: How will it be worn? Where will it be worn? What are the needs it must fulfill? So many questions that will sketch a strong idea without falling into the same exercise. For Beaubleu, the general idea was the measurement of time and its composition. It was necessary to return to the very foundation of what a watch is, and with that, we broke down this foundation into three distinct parts. The technique (the movement), the transport/ornament (lug and strap) and the reading of the time. 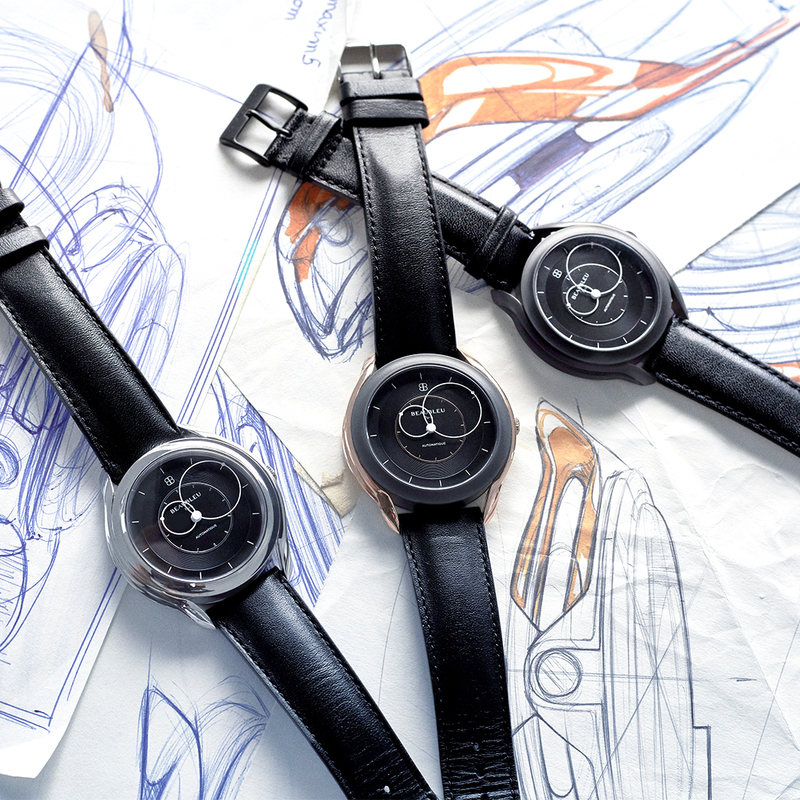 From there, the design of the watch came almost naturally. 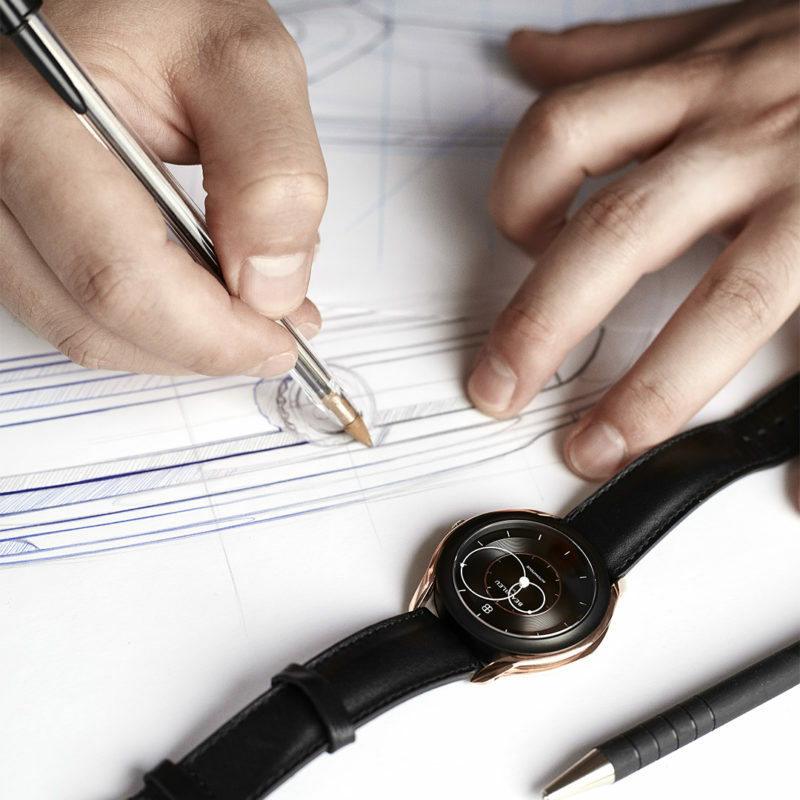 The body of the watch encloses the mechanical heart in a refined way to highlight the movement. The lugs attached to the straps were worked with curves inspired by the automobile, while the dial and hands evoke the kinetic movement of the planets, the very basis of our perception of time. The spirit of the watch: its dial and its hands. It is important to keep in mind that the wearer will glance at their timepiece several times a day for years, so the design should not tire the wearer. This part serves both time references (3, 6, 9 and 12 hours) and sets. Knowing that the accuracy is of the order of one micron (0.001mm), a watch dial of about 30 mm in diameter seems very quickly like a huge planet to fill. We played with graphics and relief to dress this space as an architect or a planner who identifies flows and uses. Grooving or joining of two pieces will be different depending on the direction of the consumed light, as will the material treatment depending on the ambient light. To create a recognizable piece, we focused on: a shape, a treatment, a color and a graphic. To be consistent with the concept of the sundial and our Galilean inspirations, we had to rethink the idea of a temporal indicator or more simply: the hands. Every creation is a succession of returns between inspiration and sketches. The B01 was no exception; after several tests and returns on the work of Galileo, the round hands gradually took shape to finally give the signature Beaubleu. The round hands then became indicator and graphic. By crossing each other, they form an evolutionary graphic throughout the day; from the alignment of the planets to the race of the sun, it is a spectacle within reach of a wrist. 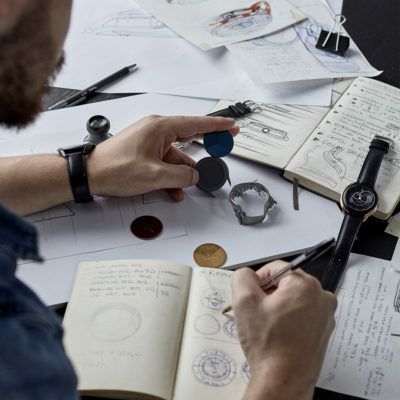 We could talk for hours and to continue to share our passion for design and watchmaking, but we invite you to contact us to discuss it first-hand.